It’s hard to believe the summer is coming to an end! Are you scrambling a bit to get the final school supplies together? I know I still need to buy new tennis shoes for my 4 year old (who knew feet grow so much faster in the summer?!) and a few school supplies too for my sweet girl who is headed to 2nd grade. We’re out of town this weekend (what were we thinking…) and the first day of school is Monday. At this point I’m just holding on for the ride! There have been a few things that have been helpful though as we’ve been preparing our routine for the transition back to more structure in the mornings and more busy afternoons and evenings. 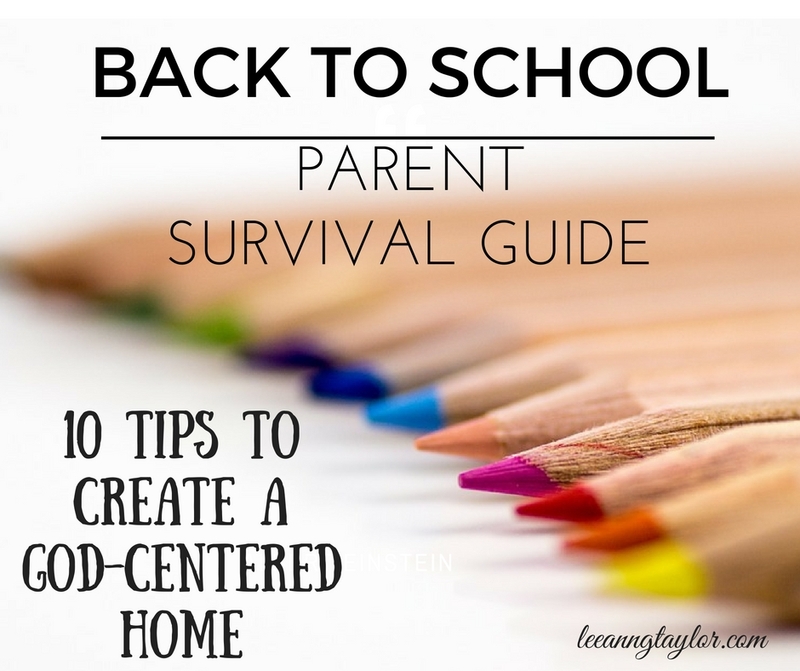 So here it goes…10 tips to help you survive the Back-to-School season. I hope these will add some sanity to your life along with providing some practical tools you can use for creating a more God-centered home! I don’t know about you, but if my exterior world is in chaos, so is my interior world. Before we can create healthy homes where God is at the center, it’s helpful if we focus on some practical ways to create peace in our homes. This is all about setting yourself up for success. Get the kids into a nightly routine of tidying up, setting out their clothes, shoes, and bookbags for the next day, and packing their lunch box. The more you have ready in the morning, the less stressful the morning will be. PRO TIP: Play a silly song on YouTube and then race to see who can finish first. The kid who wins gets to pick the book we read before bed! 2. Set aside a specific place for schoolwork ahead of time. There’s nothing that drives me crazy more than piles and piles of school paperwork strewn all over the house. 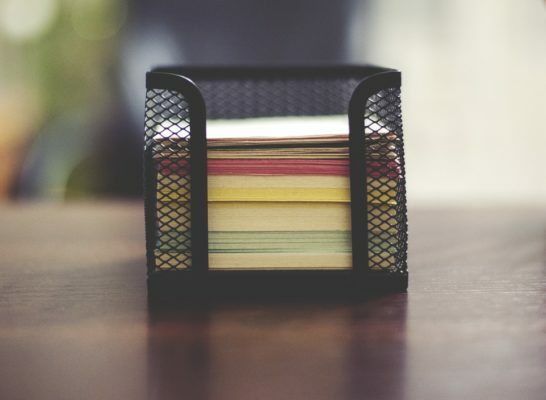 There’s so much paperwork to keep track of at the beginning of the year that it’s essential to come up with a strategy to deal with all the paper ahead of time. We designate one box per child for papers and then go through the box weekly. If I’m looking for a permission slip or details on a school fundraiser, I’m more likely to find it if it’s in the child’s box instead of stuffed in his or her backpack or buried in a pile on the kitchen table. PRO TIP: Also designate one box or extra large zippered bag per child for papers to keep throughout the year. Let your child know ahead of time that whatever they want to keep from that school year must fit into the designated container. 3. Have last minute school supplies shipped to your door. Instead of getting frazzled when your child’s teacher requests yet another school supply, then running out to the local Wal-Mart late at night just so you can go without a gaggle of kids begging for every last thing on the end caps of the aisles, utilize my secret weapon of choice — Amazon Prime. There is something truly glorious about picking out what you need from the comfort of your computer or phone and then it showing up on your doorstep two days later. Not an Amazon Prime member? Try Amazon Prime Family free for 30-days. In addition to free 2-day shipping, you also get free access to unlimited music streaming and videos, storage for your photos, an extra 20% off diapers, and more family-friendly discounts. PRO TIP: You can also share certain Amazon Prime features (like free shipping) with a family member for FREE! Just add them onto your membership through the Amazon Household function. 4. Plan your meals. Or better yet, have groceries delivered to you! In an ideal world, we’d all have our meals planned out for the week, all the groceries we need on hand would be in our kitchens, and we’d never be scrambling for something for dinner at 5pm. In reality, more days than not I’m still pondering what’s for dinner on my way home from work. This inevitably creates a grouchy momma and hungry kids. As the school year begins, it’s the perfect time to try out a meal planning system that works for you. Whether it’s a schedule on paper, on your phone, or an online service, taking the time to get even a tad bit more organized in this area will significantly reduce the chaos of your evenings. These are my favorite printable menu planners – available in 12 different formats for free! This is my favorite online meal planning service – it’s very reasonably priced and a there’s a 30-day free trial option. This is where I store my favorite recipes from both family members and my favorites from online. PRO TIP: If it’s in your budget, use a service like HomeChef to deliver groceries for meals right to your door. This is a “secret weapon” type service we use on busy weeks when we still want a home-cooked meal ready in 30 minutes. 5. Go to bed on time. This might seem like a simple one, but there’s no bigger detriment to peaceful school day mornings than grouchy, sleepy kids who won’t get out of bed or are miserable after they’re up. And let’s be real…sometimes it’s US who need the reminder to go to bed on time, right mamas? If we’re not well rested, we’re more likely to be short with our kids and sabotage our mornings. If you’re not sure how much sleep everyone in your family needs, the National Sleep Foundation shares a handy chart with updated sleep recommendations for each stage of life. PRO TIP: Give your children the tools they need to succeed in the morning. Try providing them with a basic alarm clock and empowering them to get up on their own. 1. Pray for your kids. There’s nothing more powerful than prayer, especially praying specifically for your children. As much as we desire to protect our children, God truly is the ultimate provider and protector and our purposeful prayer reminds us of those truths. Need some direction or practical resources? 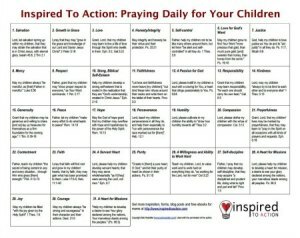 Check out the following resources here: Praying With Purpose: Praying for Your Kids. 2. Create a morning routine that includes scripture, prayer, or worship music. 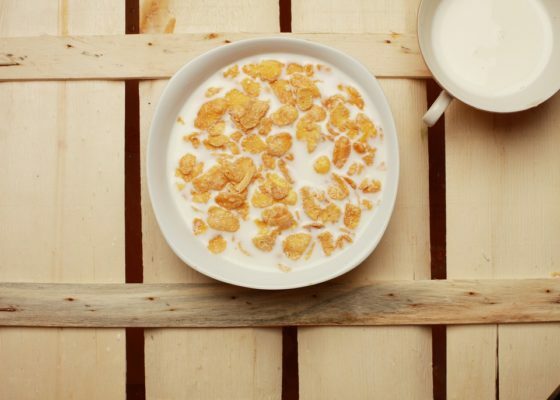 There’s lots of talk online about the importance of morning routines. 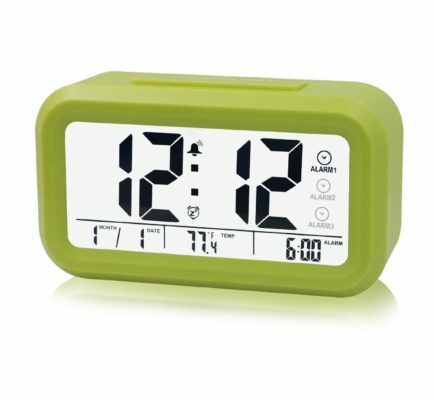 Even I’ve thrown my two cents into the ring with a post on Maximizing Your Mornings. The key to creating a God-centered home in the mornings though isn’t the perfect morning routine. Instead, focus on the one or two things you KNOW you can do with your children in the mornings and know that anything you do will reap a harvest in their hearts. Say a prayer before breakfast. Keep a family gratitude journal and write in it each morning. Work on memorizing one scripture together at the breakfast table. Keep the same one for a week so you’re more likely to actually memorize it! Play music like Seeds Family Worship while kids are getting ready for school to start their day off with truth. 3. Try memorizing scriptures as a family based around what your kids are struggling with. Last school year I sent my daughter to school with a scripture printable of Joshua 1:9 on the front of her binder, a daily reminder for her to be strong and courageous and not to be afraid since God is with her wherever she goes. Maybe your kiddos struggle with fear or anxiety or something else. Encourage them by memorizing key scriptures to they will be armed with truth as they head to the challenges that arise in daily life at school. 4. 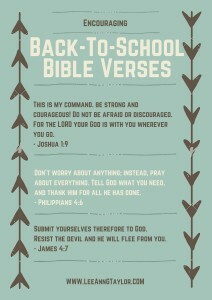 Send scripture with them to school. It’s so important to plant seeds of truth in our kids’ hearts. 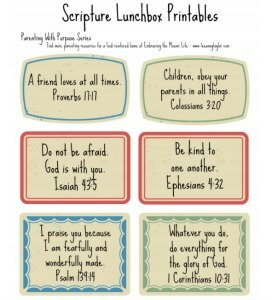 One extra way to do that is to include scripture notecards in their lunchboxes. You can download and print these or make your own! Finally, don’t forget about investing in your own spiritual development. You can only pour out encouragement and love to your children when you’ve been filled up. 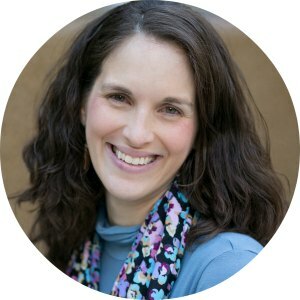 I’d encourage you to find a local or online Bible study to connect with other moms as the school year begins. We thrive in community! It’s the way the body of Christ was designed to function at its best. If you’re looking for an online study, I’d love to have you join me in the Parenting with Purpose private Facebook group for a book club! We’re going through the book and study guide of Triggers: Exchanging Parents’ Angry Reactions for Gentle Biblical Responses starting Monday, August 29th. 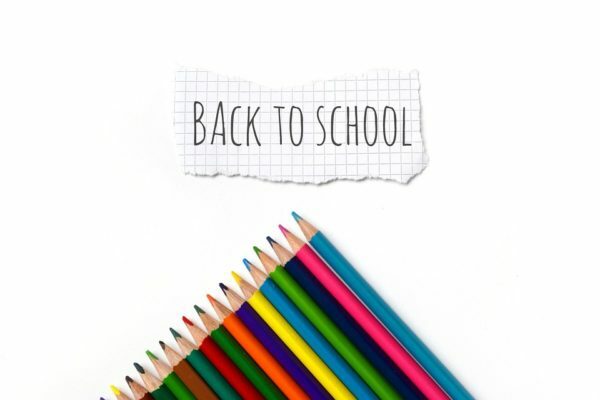 What are YOUR best tips for surviving the “back to school” season? Leave a comment below and share your wisdom! Linking up with Literacy Musing Mondays and From Messes to Messages.